How to Choose the Correct Wall Mount? Before you purchase a TV mount, make sure what kind of TV mount do you want? A Tilt & Swivel Mount, Fixed Wall Mount? Or Slim and Low Profile Mount? Measure your TV and choose a suitable mount to fit your TV. First, measure the dimensions between the screw holes on the back of your TV, and make sure that your measurements are SMALLER than the MAX Fitting Hole distance. Measure the weight of your TV, and compare with the Maximum Weight mentioned in the description. This bracket is made to fit 17" - 55" inches 3D, LED, LCD, Plasma, TV. The convenient Swivel and Tilt mechanism allows you to adjust the TV angle to get the optimum viewing angle. Whether it is to avoid glare or positioning it towards the sofa for a perfect view from anywhere in the room. 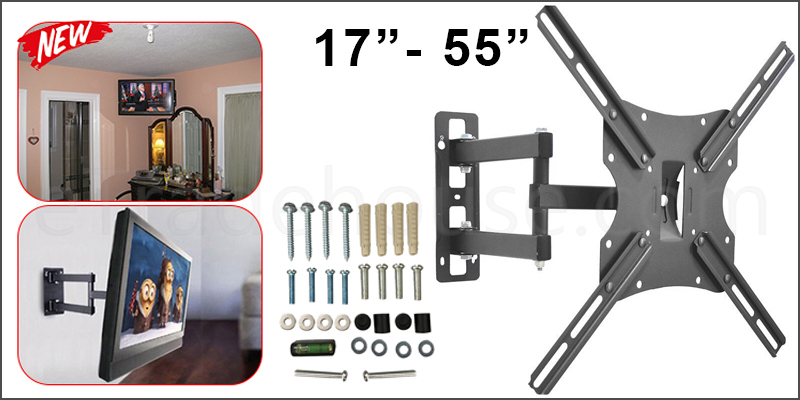 With 20 degree tilt up and down, as well as the 180 degree swivel, the Swivel and Tilt TV Mount Bracket is the perfect wall mount bracket for your TV. Constructed from solid, sturdy steel, there will be not a problem in supporting up to 20KG 3D, LED, LCD, Or Plasma televisions.